The UMD Junior Endeavor Transfer (JET) Program is a program to help Maryland Community College students transfer to the University of Maryland to complete their degree in aerospace engineering. The JET Program enables Maryland resident students beginning their education at an in-state community college to complete their B.S. degree in Aerospace Engineering at Maryland. JET is a summer program administered by the Department of Aerospace Engineering. The primary purpose of JET is to help ease the transition for Maryland external transfer students from area community colleges and get them on a 2-year track to completing their B.S. in Aerospace Engineering. They receive financial support to pay for a required 200 level ENAE course which is not offered at community colleges, and they take a non-credit course tailored to help them adjust to the department and UMD. The JET program is only available to transfer students who have been admitted to the A. James Clark School of Engineering for the fall semester and must be completed the summer prior to their fall enrollment. What are the Program Components? Introduction to labs, department, policies, resources, etc. Small-scale research project and presentation. Introduction to airplanes and space vehicles as aerospace systems. Fundamentals that describe these systems. Elements of aerodynamics, airfoils and wings. Airplane performance, stability and control. Aircraft and rocket propulsion. Fundamentals of orbital motion. Aspects of vehicle conceptual design. If you have questions about the JET program or are interested in applying, please contact Aileen Hentz at anhentz@umd.edu or Briana O’Neal at bnoneal@umd.edu. To view course equivalents at your institution, visit UMD's Transfer Course Database or ARTSYS. We encourage students to complete this requirement at their local institution if possible. We may accept a combination of a programming class (C/C++) together with an Engineering Computation course (Matlab-based) from a community college as equivalent to ENAE202. Students should contact Aileen Hentz anhentz@umd.edu or Briana O’Neal at bnoneal@umd.edu for questions regarding course equivalency. ** ENAE283 is not available at community colleges. It is offered at UMD during the summer (component of the JET program). Note: ENAE202 and ENAE283 must be completed before receiving permission to enroll in any junior-level aerospace courses. 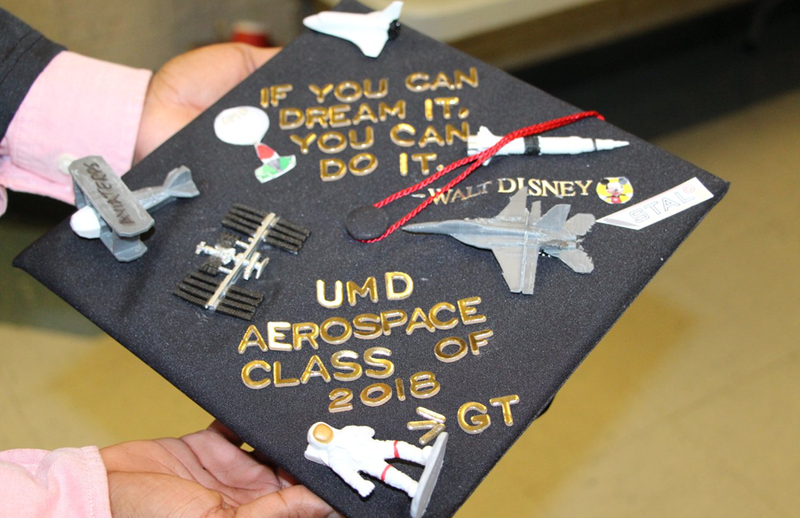 If these courses are not completed prior to starting your Aerospace degree at UMD, students should expect to take at least 3 years to complete their degree.